As many of you know, I am still searching for my first full-time student pastor position. Awhile back I saw the book The Indispensable Youth Pastor and noticed the first part of the book was dedicated to helping you land a youth ministry job. Honestly, this was the first book I saw on this subject so I instantly wanted to grab a copy. My fiancée surprised me and gave it to me as a gift a few weeks ago and I just finished reading the first part. The last book I reviewed here on my blog was Alvin’s Reid book Raising the Bar so I figured it was time to post another book review. Since I only read the first part of the book about landing a youth ministry job, I am only going to review that part in this post. On down the road I hope to read the rest of the book and post a review on it. 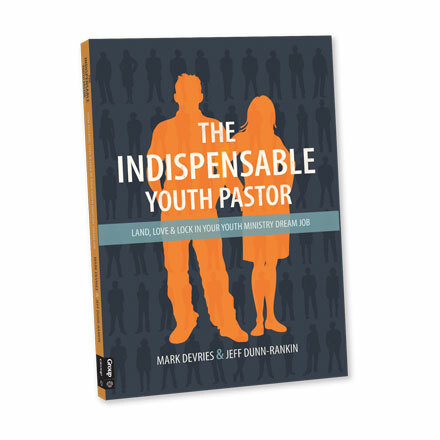 In The Indispensable Youth Pastor, authors Mark DeVries and Jeff Dunn-Rankin attempt to do three things for the reader: land, love, and lock in your youth ministry dream job. The book is broken down into three parts based on that attempt and I believe the first part, landing a youth ministry job, provides some of the best advice I have ever heard when it comes to searching for a youth ministry job. The chapters are extremely short, only about two pages each, so it makes this book easy to read and apply the advice given. The first chapter cuts right to the heart of the matter, before you can worry about landing that youth ministry job, you need to be the right person. If your going to be effective in that dream youth ministry job you better have a growing, vibrant faith that you can pour into students. Here are two great quotes from this chapter: “The only way to share a vibrant faith is to have a vibrant faith” and “We can’t share what we don’t have.” From there the book talks about engaging in youth ministry wherever you are now, and realizing youth ministry is more than hanging out with students. Then you come to a few chapters that deal with the way you go about your search. The authors suggest you make two helpful documents: a contact tracking chart and a personal search timeline. These two documents will allow you to gather a group of contacts as well as track your search so you know where you are at. Personally, I have not made these two documents, but have taken the principles from the idea and it is helping a lot! Then the book spends the next few chapters on your resume. It deals with having the right type of resume, knowing what your references will say, and how to handle interviews once your resume lands you a face to face interview. Then you get to the last two chapters in this part of the book: family matters and holy hesitation. These were probably the most helpful and encouraging chapters for me. When it comes to searching for a youth ministry job, you must always keep your family first and keep them in the loop with the search process. The authors encourage you to think about things like: how often will your family see you if you take this position, will you have to move for this position, and does it pay the bills. They always encourage you to never stop talking with your family and allow them to be a part of the search process. Then the authors end this part of the book of right, reminding you it’s all about God’s leading and direction. Sometimes we experience a “holy hesitation” when God puts something in front of us. The authors remind you that sometimes that holy hesitation comes right before you step into that dream youth ministry job! By far, this book provided the best advice I have yet to receive when it comes to my student pastor job search. If you are currently in a search, I would highly recommend you grab a copy of this book (Click here to get it on Amazon) and spend some time soaking in all the advice and helpful tips it provides. The rest of the book covers how to love and lock in that youth ministry job you have so if your currently a student pastor, I would recommend this book to you as well. Click here for a great review of the whole book by Drew Peterson. Also, if you’re a pastor or person on a search committee that is on the other end of this topic, check out the authors other book Before You Hire a Youth Pastor.